For the money, the Trimline T370 HR treadmill gives you a solid, consistent workout. 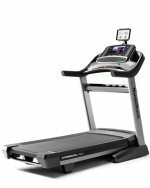 Not only does it offer a huge comfy deck and smooth incline adjustment, but the “HR” in the name means it comes with a heart rate interactive monitor, which is always an advantageous feature on any treadmill. The Trimline T370 HR offers a choice of 21 treadmill workout programs, (7 preset, 12 custom and 2 heart rate control programs), yet the readout isn’t overly cluttered; it’s simple in design. The tri color display shows time, speed, distance covered, incline range, calories and cals/min, pace, and heart rate. The dot matrix display provides a course profile so you can see the “hills” and “flats” the incline will adjust for the program. UPDATE: Trimline treadmills are no longer being produced. 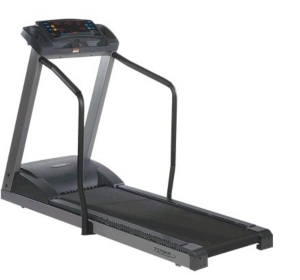 Check out our Best Treadmills $1000-$2000 section to find a comparable model. Trimline treadmills are noted for being reliable, affordable machines with the top selling point and best feature being the quality of the motor. The Trimline T370 HR is equipped with a commercial motor that lasts for years, which is the reason they can offer that generous 30 year warranty. The only drawback testers mentioned is that the motor seems a tad noisy compared to some other treadmill brands in this price range. In treadmill-speak, the $2,000 mark is what separates the serious fitness enthusiast from the casual weekender who uses a treadmill to hang laundry on. In this price range, you expect to find better quality machines that can handle aggressive runners and the solid 3.0 CHP motor on the Trimline T370 HR certainly handles the workload. Just don’t pay too much for this one. If you are committed to spending $2,300 or more for a machine, you should consider going with the Sole TT8 which has more bells and whistles and offers better value for your money than the Trimline T370 HR treadmill.